Free Spell Checking Services for Kijiji Ads. Seriously, people, do you need me to check your ads for you? Because I will. 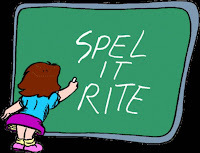 Because it drives me nuts when people can't spell "diffrent" or "apreciate." So e-mail me before you post, and I'll check your ad for you for free, so you don't look like an idiot. Or you could try http://www.spellchecker.net/spellcheck/, since you're already on the Internet anyway, and it takes about five seconds to click over to another website. Either way, if you e-mail me or copy and paste the link above, please, spell check before you post!